Time constraints meant that I was never going to get away for a walk up a hill on Saturday, but we had been hoping to have another wee shot in the canoe. The wind and rain in the morning however, when I was down at the castle with the dugs, quite properly put the tin lid on that idea. I doubt we'd have managed to drive to Loch Lubnaig without getting blown off course, never mind trying to paddle anywhere once we'd got the boat off the roof. Instead, I pottered around the shops in the afternoon and finally got myself a new monitor for the computer. Suffice it to say that it has transformed my viewing pleasure. Photographs now look like photographs, rather than murky dark shadowy abstract photographs. Which is nice. Today would have been better paddling weather (note how easily I adopt the language of the experienced canoeist! ), but family stuff was on the cards, so we just took a run over to the Boathouse at Auchinstarry near Kilsyth, to check out the wee marina thing on the canal. It's rather pleasant, and I think a good spot to bear in mind for future attempts at going doon the watter. It'd certainly be a good spot to sit overlooking the canal, drinking beer and talking about an attempt at going doon the watter. 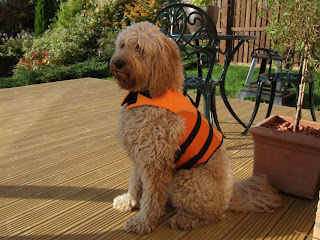 There was a brief sunny interlude this afternoon when we got back to the house, so I used it to get Molly used to her new dug buoyancy aid which arrived this week. Twice the price of our buoyancy aids, I hasten to add! Still, she undeniably looks better in hers than I do in mine. You're not taking the poor dugs in your new dug-oot??? That's cruel by any standard. Poor Molly has that long suffering look - just because someone wants to dress their "dolly" in the latest outfit. 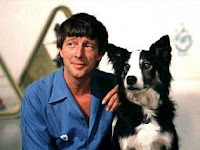 Marion insists that the dug goes nowhere near the water without all possible safety precautions being taken. She was quite happy to let me & Andy go out before we'd got our lifejackets, needless to say. In fairness, Molly's such a poser that she thinks her orange jaikit is a fashion accessory. The Wee Black Dug is disgusted with the whole idea though, I'll grant you that. You're cruel to that poor dug. You'll be getting here some jessie-dug-hiker boots next, I'll warrant! In fairness, Molly probably needs it, but Jorja might be able to swim faster than you guys can paddle anyway.